As I’m currently looking to build up my work-wear wardrobe, I started with A|wear, my one-stop shop for office-chic items. As I always do, I had a quick nose at the website to see whats on offer before I set out for the actual store. A|wear.com is distractingly entertaining and there are so many features and things to click that I almost lost sight of what I was initially looking for! It has all the fundamentals of an online store, the option to browse through clothes and accessories by category, colour etc. The home page shows off photos from the new collection, which at the moment is Chic Safari. 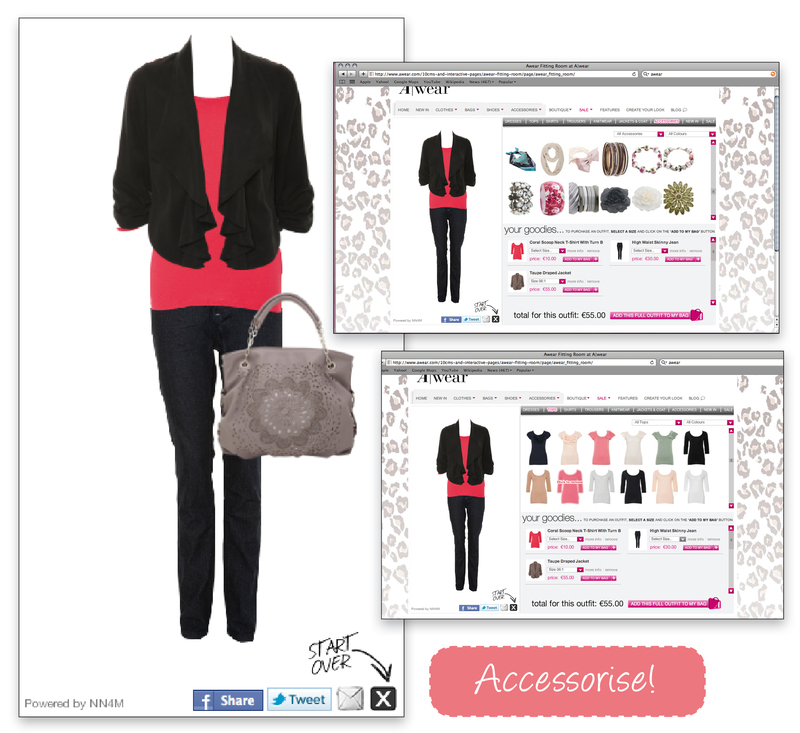 The image box on the right hand side is the ‘Pick of the Week’ and there is a scrolling menu along the bottom advertising featured items and outfit ideas, all when clicked on will bring you to the product(s). So, back to work wear, and I begin my search with skirts. One click on an image, and the product information comes up with photos of the skirt- front and back. I love this black pleat drape skirt (€35) and I actually already own it, but it doesn’t end there. I can choose the ‘Create Your Look’ option on the top menu and pick this particular skirt and match it with any other item from the A|wear store. This virtual dressing room puts the ‘fun’ in functional and is a stroke of marketing genious! If I add a top or cardigan, the image on the left will show how it look pieced together. There is also an option to share this look on Facebook and Twitter. The box on the bottom right of this web page tots up the total cost of the outfit, I can then proceed to checkout and, voila, a whole new outfit bought from the comfort of my own home. Another fun part of A|wear.com is under the ‘Features’ option on the top menu. 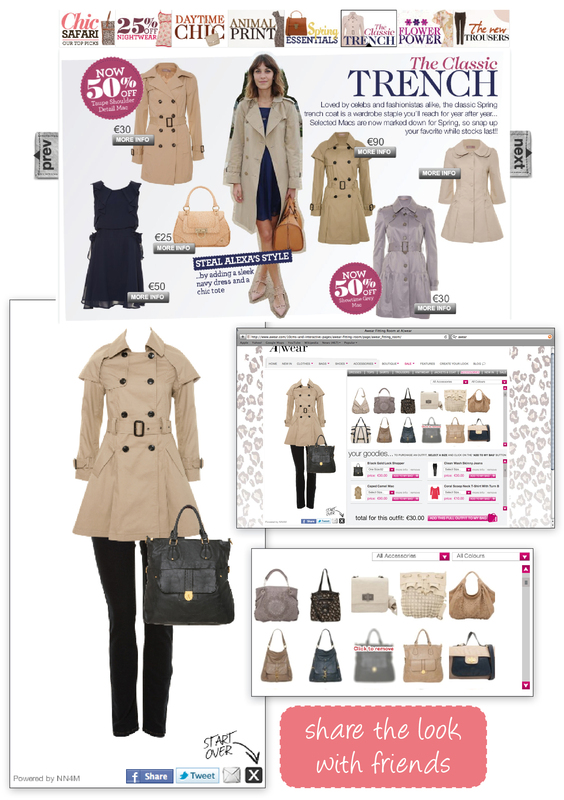 Magazine style layouts advertise the latest collection and trends. The Classic Trench feature tells you how to steal Alexa Chung’s style, all with items from A|wear. I find myself, again getting sucked in, so I click on the image which shows me the product information and before I know, it, I’m back to the virtual dressing room piecing an entire outfit together based on this jacket! Aside | This entry was posted in Cyber Shopper and tagged accessories, alexa chung, awear, awear.com, chic safari, create your look, facebook, feature, fitting room, fun, online shopping, skirts, style stealer, trench coat, twitter, work wear. Bookmark the permalink.